WASHINGTON, D.C. -- A dramatic gulf in economic activity separated countries with the highest and lowest percentages of their populations working full time for an employer in 2014. The 10 countries with the highest Payroll to Population (P2P) rates in 2014 all had P2P rates of 44% or more, with Qatar and the United Arab Emirates at the top. Meanwhile, the countries with the lowest P2P rates -- most of them in sub-Saharan Africa -- ranged from 7% to just 3%. Gallup's Payroll to Population rate, the percentage of the total adult population who works at least 30 hours per week for an employer, remained stagnant at 26% in 2014. 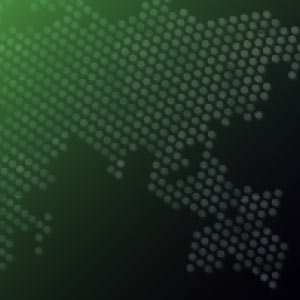 Gallup's latest global P2P measurements are based on more than 182,000 interviews across 144 countries in 2014, in which adults were asked a battery of employment questions modeled from International Labour Organization (ILO) standards. Gallup does not count adults who are self-employed, working part time, unemployed, or out of the workforce as payroll-employed in the P2P metric, and it is not seasonally adjusted. Regionally, Northern America continued to have the highest percentage of adults working full time for an employer in 2014, at 44%, and sub-Saharan Africa continued to have the lowest regional rate at 11%. 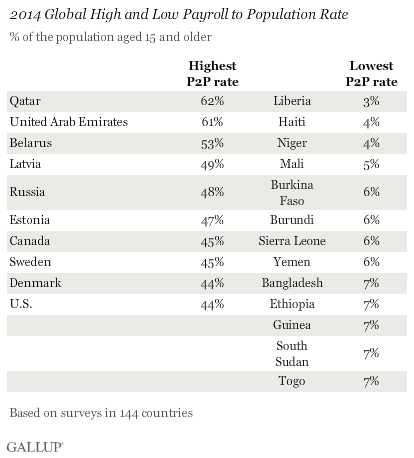 The Middle East and North Africa (MENA) had the second-lowest rate (18%), despite two countries in that region ranking at the top of the list in 2014: Qatar at 62% and the United Arab Emirates at 61%. The populations in these two countries, along with others in the Persian Gulf region, include large percentages of expatriates who live in the country just to work -- which contributes to their higher P2P rates. P2P increased by one percentage point in East Asia, Northern America and Western Europe, matched by increased workforce participation (East Asia and Western Europe) and lower rates of part-time work (Northern America). P2P decreased by two points in Northern Europe and the former Soviet Union, matched by increased part-time work and decreased workforce participation. Canada and the United States, two of the most developed nations in the world, make up the Northern America region. Along with other highly developed economies, these countries have both relatively high workforce participation (71% in Canada, 68% in the U.S.), comparably low unemployment and high rates of formal economic employment that is well-integrated into the global economy. Less than 10% of adults in either country reported being self-employed in 2014. While the former Soviet Union region shows a high average P2P rate, this is primarily attributable to Russia's high P2P rate and large population. Russia and Belarus are the only countries in the region with P2P rates higher than 40%, related to their high workforce participation and low under- or unemployment. There were wide disparities in P2P within Europe, with Northern European countries such as Sweden and Denmark (45% and 44%, respectively) greatly outpacing Southern European countries such as Albania, Kosovo or Greece (15%, 16% and 21%, respectively). These latter countries suffer from some of the highest unemployment rates in the world, as well as low workforce participation. Workforce participation measures the percentage of adults who are working, or who are unemployed. Gallup defines the unemployment as those adults who did not have any paid work in the past seven days, for an employer or themselves, and who were actively looking for and available to work. Adults who were not employed and were not looking for and available to work -- including full-time students, homemakers, the retired or the disabled -- were classified as "out of the workforce." The Middle East and North Africa had the lowest workforce participation of any region in 2014, with 51% of the adult population neither working nor looking for and available to work. This rate is partly driven by the low rate of participation among women in these regions, who often do not work for cultural reasons. Unlike other employment categories, the percentage of adults working full time for an employer has a strong positive relationship with national economic well-being as measured by GDP per capita. Looking at all the countries in which Gallup has measured employment from 2009-2014, differences in P2P rates explain roughly 67% of the difference in GDP per capita. By contrast, differences in unemployment rates, part-time work or even workforce participation generally showed little relationship. Full-time self-employment rates and working part time but desiring full-time work both show relatively strong negative relationships with GDP per capita. P2P has consistently shown a strong, positive relationship with other objective economic measures such as GDP per capita as well as more subjective assessments of quality of life and well-being. 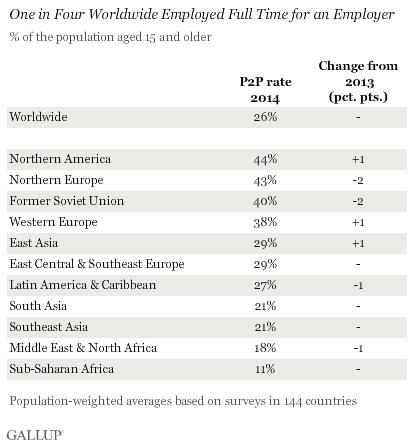 The results of Gallup's global employment research in 2014 continue to confirm this analysis. Low P2P rates generally indicate underutilization of a country's or region's human capital, whether from generally weak economic development or from socio-cultural factors, such as those that might restrict workforce participation by half the population because of gender. The data in this article were generated from Gallup Analytics. Read the full Good Jobs 2014 report. Results are based on telephone and face-to-face interviews with approximately 1,000 adults in each country, aged 15 and older, conducted from 2009 to 2014. For results based on the total sample of national adults, the margin of sampling error ranged from ±2.1 percentage points to ±5.6 percentage points at the 95% confidence level. The margin of error reflects the influence of data weighting. In addition to sampling error, question wording and practical difficulties in conducting surveys can introduce error or bias into the findings of public opinion polls. GDP per capita data for 2009-2013 was taken from the World Bank's Economy and Growth indicators database. GDP per capita for 2014 was taken from the IMF's World Economic Outlook Database -- April 2015 update. The total number of country-year data points used for comparison over the span 2009-2014 was n=736.